Dobzhansky (Jan.25, 1900–Dec. 18, 1975) is noted for being one of the architects of the modern Synthetic Theory of evolution. During the first 20 years of the 20th century, Darwin's theory of natural selection had fallen out of favor among scientists. Many thought it insufficient to explain the origin of adaptations, while new discoveries of gene mutations seemed to them to be incompatible with Darwinian models of change. 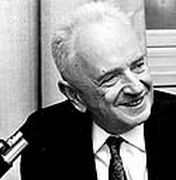 But in 1937 Dobzhansky published his book, Genetics and the Origin of Species, that was the first systematic overview view encompassing organic diversity, variation in natural populations, selection, isolating mechanisms (a term he coined) and species as natural units. Later, working with Sewall Wright, he went on to demonstrate how evolution can produce stability and equilibrium in populations rather than constant directional change. link. image.